Lack of a serious critique of social democracy, and the role that it may still play in the capitalism of today, leaves “the left” open to being drawn back into its clutches once it appears in a seemingly new or unexpected form. The Corbyn phenomenon provided exactly such an opportunity, to the point where even some supposed anarchists have now joined the Labour Party ranks. Inventing the Future was written just before the rise of Corbyn, but in 2015 social democracy was already a visible force strong enough so that it could once again lead masses of people into electoral and reformist dead ends (e.g. Syriza, Podemos). While a section of the left does indeed embrace a form of folk politics that Srnicek and Williams go on to criticise, the social democratic illusions of the left never went away. For anyone aware of the state of working class politics in Britain this should be obvious – the myth of 45, the trade unionist, Trotskyist and Stalinist hopes for the return of a "real" social democratic party, whether that be the Labour Party, or failed projects like TUSC or Respect, are many. Great swathes of the British left have always aligned with social democracy rather than any “horizontalist” alternatives. The Labour Party currently has over half a million members, and as Srnicek admitted during the general election of 2017: “In the end, Labour has presented a vision of a better world and the massive rallies attest to the power such a vision can mobilise […] we need to build on the momentum achieved in the campaign.”  And so it seems the accelerationists have been outpaced by old-school social democrats! Behind all the accelerationist and futurist rhetoric lies what amounts to a number of fairly mundane transitional demands: universal basic income (UBI) , automation and the reduction of the working week. Automation is marching onward regardless (whether it is reducing the number of jobs or producing killer drones), while basic income pilots have already been initiated in multiple countries, from Namibia to Finland. All of this without the need for any accelerationist left to “demand” it. What that left can now do, according to the authors, is to accelerate these processes and influence the way they are implemented. For them these are non-reformist reforms which “will not break us out of capitalism, but they do promise to break us out of neoliberalism, and to establish an equilibrium of political, economic and social forces.”  In terms of tactics, Srnicek and Williams’ vision is allegedly a long term one. The rise of neo-liberalism took 40 years or more. Likewise the British left will need to over time build its own hegemony. This has to include politicians, business experts, new media, and academics – with Corbyn, McDonnell, Piketty, Stiglitz, media outlets like Novara or The Canary, Paul Mason and Owen Jones, and indeed the authors themselves, first steps towards this have been made. That is not to say that in their vision there is no place for the “grass-roots”. Inventing the Future has already made an impact on the Labour left. In 2015 Srnicek and Williams were sending copies of the book to the new Labour shadow cabinet in the hopes that it would help the Labour Party address “the most pressing issues of the 21st Century”. 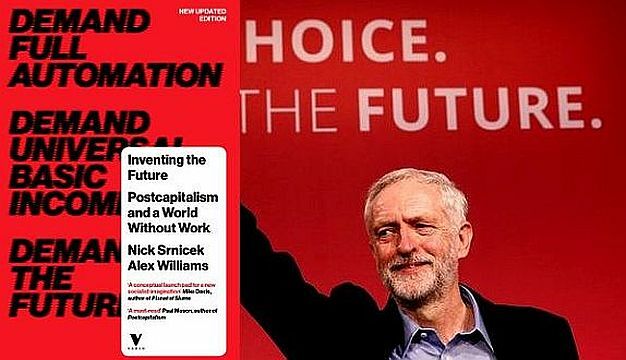 By 2016 the book was popular enough in Labour circles that Srnicek was invited by John McDonnell to give a talk on “Technology and the future world of work” during a series of public events on “New Economics” convened by the Labour Party. In 2017 Inventing the Future got a mention in a report commissioned by John McDonnell and Rebecca Long-Bailey. That same year Srnicek also gave a talk at the Labour conference fringe event, The World Transformed. This convergence is not incidental. There are two ways to read Inventing the Future. One is a fairly innocent critique of the “post-68 left”, and an outline of how to build a desirable post-capitalist future through a flawed Gramscian framework . The other is a critique of working class self-activity, and a call for a benevolent class of technocrats who can gradually reform capitalism for the masses. The book is written in a way that makes it seem like the two interpretations are not mutually exclusive, which might be part of the reason behind its appeal (name dropped in the New Statesman and the Guardian, three years after release it still easily available in high street bookshops). This mixture of Gramscian terminology and accelerationist imagery does have some appeal among the university educated left, and combined with the willingness of figures such as McDonnell to engage with economic ideas deemed “cutting-edge” or “radical” by the mainstream press, it does give Corbyn’s shadow cabinet a facade of modernity – whether anyone in the upper echelons of the party actually take it seriously or not, it helps to counter the propaganda of the Conservative right that a Labour government “would take the country back to the 1970s”. See the introduction to our Durham meeting on universal basic income (UBI) to expand on this theme. For more on Gramsci see leftcom.org. The translation of Onorato Damen’s book on Gramsci will appear later this year.